CINCINNATI (AP) — A.J. Green has a collection of stories about quarterback Jeff Driskel’s athletic exploits, such as the way he can dribble between his legs and dunk. It’s up to the backup quarterback to keep the Bengals’ slim hopes alive. Although the teams have identical records, they’re on totally different trajectories . The Broncos are coming off a 23-22 win over the Chargers in Los Angeles and a 24-17 home victory over the AFC North-leading Steelers . They seemed all but eliminated after a 3-6 start, but have been given a second — and final — chance to salvage their season. A win on Sunday is mandatory for a team that’s starting to feel it can still accomplish big things. Case Keenum was picked off 11 times in the first eight games but hasn’t thrown an interception in the past three, a thread in the Broncos’ revival. Keenum is getting more comfortable, and it’s rubbing off on the rest of the offense. He faces the NFL’s worst defense on Sunday. Baker Mayfield threw for four touchdowns without an interception in Cleveland’s 35-20 win last week at Paul Brown Stadium. Keenum’s goal is to keep up the trend. 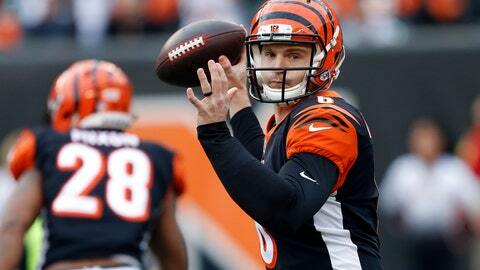 After Dalton left the game last Sunday with his thumb injury, Driskel threw his first NFL touchdown pass and ran for another score. He had problems getting the offense on the same page — five false-start penalties in the fourth quarter alone. Some rust was expected with a quarterback who hadn’t worked with the starting offense all season. The biggest challenge will be staying calm enough to keep everything under control. Driskel’s had a week to think about his first NFL start, so the Bengals expect some nerves early. The Bengals’ offense struggled during the three games Green missed. His return — even if he’s not 100 percent — would impact the game significantly. The Bengals are a far more dangerous offense when Green is lining up. Only one team — the Broncos — have faced a tougher schedule so far than the Bengals, based on opponents’ winning percentage. The Broncos’ opponents are 69-50-1 for a .579 winning percentage. The Bengals’ opponents are 67-52-2 for a .562 winning percentage. After Houston escaped Denver with its sixth straight win after Brandon McManus‘ 51-yard field goal sailed wide right, the Broncos bounced back to end six-game winning streaks by the Chargers and Steelers.